With recent news about Ghana’s middle-income status, a cursory look at its healthcare system reveals rather an appalling visual and the lack of insight that raw economic data on countries like Ghana indicate. 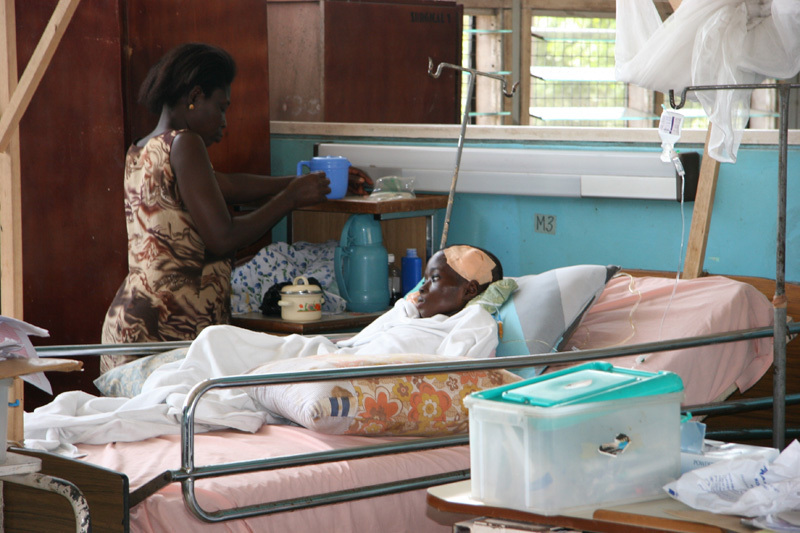 Ghana has only 3 teaching hospitals, 9 regional clinics, and three Psychiatric clinics. Depending on which political party you ask, and which political party a Ghanaian demographer is affiliated to, the population of Ghana hovers between 24 million and 30 million. A colonial governor of the Gold Coast, Gordon Guggisberg, laid the foundation for Korle Bu Hospital in 1921 in Accra, and it was finally opened on 9th October 1923. It now serves as the Medical School of the University of Ghana. The hospital has expanded to 1600 beds. The Komfo Anokye Teaching Hospital (KATH) with its new expansion to 960 beds is the second-largest hospital in Ghana, built in 1954, and the only tertiary health institution in the North. It is the main referral hospital for the Ashanti, Brong Ahafo, Northern, Upper East and Upper West Regions. In 1975 the hospital was converted into a teaching hospital affiliated to the medical school of the Kwame Nkrumah University of Science and Technology. Both institutions haven been built by the first president of Ghana, Osagyefo Kwame Nkrumah. The University of Development Studies established in 1992 by former president JJ Rawlings, has since 2005 partnered with the Tamale Regional Clinic and has forcefully morphed into what is now called the Tamale Teaching Hospital. But the Tamale Teaching Hospital together with the Northern Region’s almost 300 public and private clinics do not contribute more than 900 beds for patients. No hospital in Ghana commands respect except for a military hospital, also built by colonialists, at the 37 Nigeri Barracks and which is trying to accommodate some 400 beds. The Ghana Police Health Service which is consistently mentioned at the Ministry of Health comprises a Hospital in Accra and 10 satellite or peripheral clinics in all but 3 regions. This 100 bed Police Hospital was established in 1976 and provides health care to more than 30,000 Police Service personnel and their dependents and the general public. Korle Bu Teaching Hospital thus remains the largest hospital and the most advanced in Ghana and perhaps the most attended in the West African region. No wonder, on its 50th Anniversary, a statue of Gordon Guggisberg was put up in front of the old administration building in total respect for the old soothsayer in that colonial governor! Thus, the total number of health facilities in Ghana number about 3200 (60 % of which are government facilities), according to a 2010 Ghana Ministry of Health estimate, with about 22,000 beds. That gives an average of about 7 beds per clinic. As if that was not disturbing enough, the average number of hospital beds per every 10,000 people in Ghana is a mere 9, according to a 2005 – 2011 estimate by the US Global Health Estimates website. Even Burundi has 19 beds for 10,000 people and Zimbabwe has 17 hospital beds per 10,000 of its population. Furthermore, of Ghana’s 2033 medical officers as of 2009, about 1430 of them reside in Accra and Kumasi alone, which gives the Ashanti & Greater Accra Regions a doctor to population ratio, DPR, of 8,200 and 5,100 respectively. The Northern Region and Upper West regions have DPRs averaging 1 doctor per 50,000 people. However, if there was any hope to reflect in these numbers in our health care sector, it will be that of nurses working in the country. Some 25,000 nurses practice in Ghana. That means for every thousand people, there is a nurse. Critics often argue that these numbers are misleading since not everyone in the country goes to the hospital and for those who go to the hospitals and clinics, they do not go at the same time. They add that these statistics do not give any insight into the effectiveness of the health facilities in Ghana. These criticisms are generally true and well meaning since statistics alone do not serve as the yardstick to measuring the state of health care in a country. What statistics like this do however from year to year, is really what indicators do. They point in very general terms albeit concrete, the direction in which a country is moving with its health care system – to hell or to heaven. Rwanda is a formidable case in point. Even now, the country has only about 625 doctors in public clinics for a population of almost 11 million. But it also has more than 8,000 nurses, and a new corps of 45,000 health care workers, elected by their own villages, to do primary care for malaria, pneumonia, diarrhea, family planning, prenatal care and childhood shots. Obviously, Rwanda does not even have a full doctor per 10,000 of its population. For every 20,000 people in Rwanda there’s only one doctor. But, largely because of these health care workers, the country has high rates of success in curing tuberculosis and keeping people with AIDS on anti-retro-viral drugs. Nearly 98 percent of all Rwandans have health insurance. Annual premiums are small and subsidized by donors, and subscribers pay 10 percent co-pays. But many aspects of preventive care, like mosquito nets and immunizations, are free. More important, the country has a national system of computerized medical records and uses cell phone text messaging to get reports from village health workers to nurses and to doctors. Since 2000, the maternal mortality ratio in Rwanda has fallen by 60 %; while that of Ghana has only managed a mere 20% fall: the likelihood that a child would die by age 5 has dropped by 70 percent in Rwanda! If these gains can be sustained, Rwanda will be the only country in the sub-Saharan region on track to meet each of the health-related Millennium Development Goals by 2015. Strict interpretation of health statistics may be more convoluted on discussions of Rwanda but not in Ghana’s case. While Rwanda marches on to success after success in its health care system Ghana seems to be falling behind and behind. The demand by Ghanaian doctors for higher pay and the flight of some to Europe and America may be culpable, but the government of Ghana has by and large failed its people in bringing much needed care to their doorsteps; something even Rwanda is accomplishing with ease and with little help from loans and donors! Menes is a Scribe at Grandmother Africa. Before joining the definitive record on Africa, he worked as an Architect in Ghana and Mali. Menes holds a bachelors in Mathematics and Economics and a post graduate degree in Digital Design. Ghana must show versatility in its Healthcare Sytem much like Rwanda. Ghana cannot be one-dimensional. Not in the twenty-fist century? Versatility is one hell of a demand from Ghana’s government. Since Nkrumah’s term we have seen very little of it, except for a dint under Rawlings’ regime. Whatsoever the case is, versatility just happens to be a measure of intelligence.Clearly this set of Ghanaian government officials lack some and even more. This health care crisis can be turned around in months; but it takes will, dedication, insight, commitment and above all intelligence. The later however, and sadly is the biggest problem. Our Health care system does not look good. To think of Ghana as the gateway to Africa is getting more and more difficult when we look at our health system. When we cannot take care of our weakest people, we have to be disappointed. And Ghanaians have a right to lose hope in their government. I hope President Mahama can wake up to the call. This issue needs strong hands on deck, committed souls to invest themselves in the people. In the interest of full disclosure, Africa was doing better than this before we started tailing the European health care system, perhaps, because it was imposed on us or that we are(have) equally brainwashed with it. Until that mentality changes, or until Africans have become fully Europeanized, this current health care dispensation we have in Ghana and Africa will continue to fall behind. There are no reasons why we cannot follow in Rwanda’s steps. Gone were the days when every African child was born at home and there were health care professionals at home to do the delivery. Now our village women have to be at Korle Bu of Okomfo Anokye before they can deliver us? Why? Are these leaders thinking or are they not? My Goodness. In Rwanda “…45,000 health care workers, elected by their own villages, to do primary care for malaria, pneumonia, diarrhea, family planning, prenatal care and childhood shots…” This seems to be where Ghana went wrong. If it ain’t broke, don’t fix it. There was nothing wrong with traditional medicine, but now they are moving away from village doctors and trying out a system with they don’t fully understand or have the technology to be able to completely incorporate it.